Stop by here before heading out to the train platforms for some high quality Japanese sweets and matcha green tea. You can be assured that they use the finest ingredients on all of their items on the menu. Tsuruya Yoshinobu, Japanese confectionery specialty shop established about 200 years ago in Kyoto, is behind this Kyoto Station branch with a new concept of “Modern Japanese”. The parfait consists of vanilla and matcha ice cream, small round mochi, sweet red bean, green tea jelly, all topped with whipped cream and a wafer (Monaka shell). Very much a Japanese style sweets you could have before you leave Kyoto or when you arrive to the city. Looking for traditional combination of Japanese sweets and matcha green tea? At IRODORI, you can have freshly made hot matcha green tea and hand-made Japanese confectionery which you can choose from six seasonal choices. 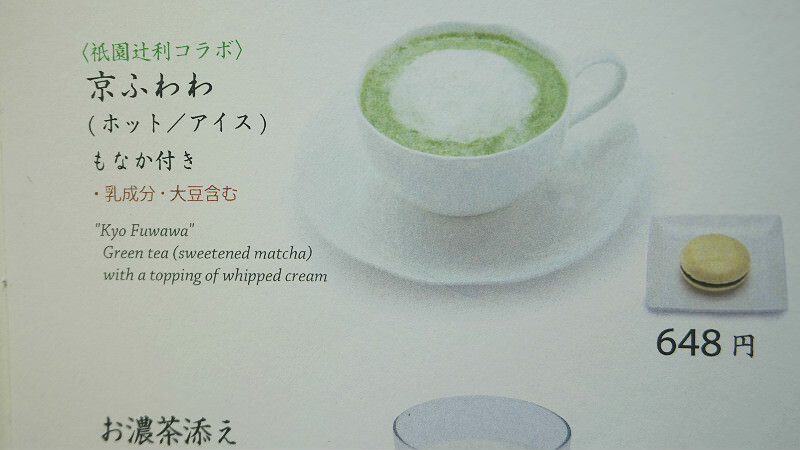 Try this delicious matcha green tea inside the café or to go. The well-appraised Tsujiri green tea is used and the perfect amount of sweetness is added with the same high quality sugar as the one used in Japanese confectioneries. English description is on the regular menu. Some green tea drink items come with a small confectionery. For to-go orders, look for the list of available drinks at the register. "Kyo Fuwawa" is just slightly sweet and very refreshing. It's also fun to see the lightly whipped cream slowly sweeping into the green tea. The café can get crowded around 2pm – 5pm.